On a PC or Mac? Access the QBank with our brand new App! The app is required for access to the QBank from all devices. You may close the test window and resume your test at any time. In-progress tests will be available until finished or deleted. For Timed Mode tests, you must use the "pause" button below to leave a test in-progress, otherwise the timer will continue to run in the background. To submit your score and view question explanations before a test is finished, jump to the last questions and then click "Leave Blank and Finish" which will appear below. 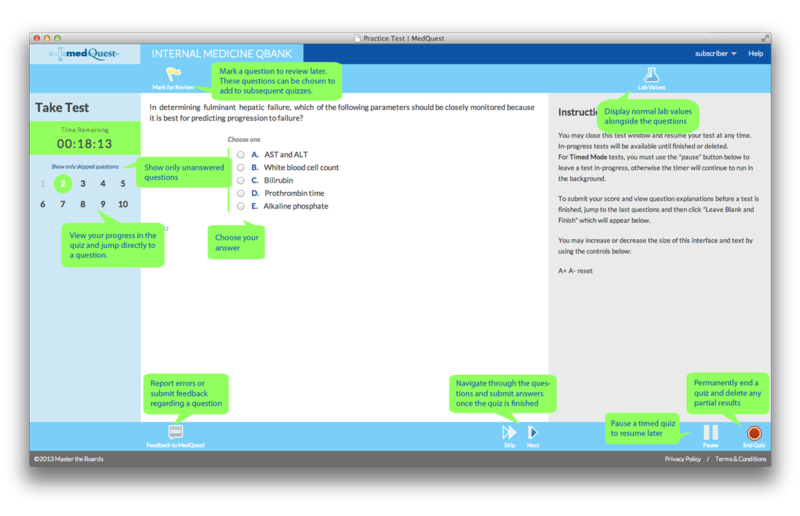 As you try to determine the single best answer to the multiple-choice questions, a Strike Out feature is available to help you visually eliminate answer choice(s) from consideration. By right-clicking or swiping right, on the text of the response, you will draw a line through the response. You may strike out as many responses as you wish, or none at all. If you make a mistake, you may also undo your strikethrough by clicking or swiping on the response text a second time. Highlight text within the QBank questions while taking a test. Highlighted text will then be shown when reviewing the test in the future. In highlighting mode, any text selected is saved as a highlight after 1 second. In removal mode, any existing highlights selected will be removed.